There’s nothing worse than having your new or freshly valeted vehicle dented by an ignorant or unaware driver. It’s not just a dent in your car, after all, it is a dent in your pride and joy. There’s no choice but to get your baby repaired. But have you considered paintless dent removal? It can be quicker cheaper and far more effective. Here’s everything you need to know about it and why you should consider paintless dent removal the next time your car gets dented. Unlike the conventional dent removal process, during which the affected area is sanded down, pounded out, smoothed over, primed, painted and waxed, paintless dent removal (or PDR) takes considerably less work. The work focuses on the outside of your vehicle, on the surface where the dent occurs. Specialist tools are used to massage the damaged area to restore its shape and to check that the fixed area is smooth and straight. As you can imagine, this has several advantages which we will discuss below. 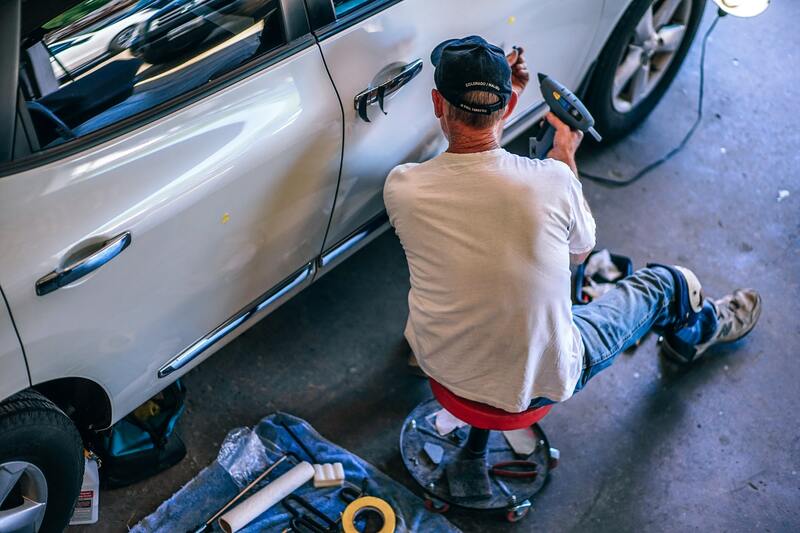 Because there are far fewer tools involved in the work, the process of paintless dent removal is much cheaper for auto body shops to carry out. Naturally, prices will vary depending on the size of your dent and where it is on your car, but as long as that dent is easy to get to it won’t cost you an arm and a leg. Because fewer tools are needed and the process takes fewer steps, the entire dent removal process is much quicker than traditional alternatives. The entire process can be done in as little as an hour, depending on the size of the dent. So it is incredibly likely that you will have your car back the same day. Guess what? Using a paintless dent removal service won’t just save you time and money, it can help save the environment, too. A lot of the time car paint contains toxic chemicals and solvents that can harm the environment when released. But because paintless dent removal doesn’t require paint—or any kind of primer for that matter—it avoids the need for releasing any of these toxins and helps to ensure that less paint is created in the first place. Obviously, the most important factor in paintless dent repair is making sure that your car looks as good as new. In fact, by using paintless dent removal, rather than more conventional repair options, you’ll be ensuring that your car looks as close as possible to its original state. That’s because there’s no need to touch the original paintwork or use abrasive materials of any kind. The body of your car is just massaged back to shape. The result is a perfect looking car that you would never know had a dent. Should you use paintless dent repair? If your car has a dent, it could be a candidate for paintless dent repair. For a free expert opinion, get in touch with a member of our team today by calling (623) 915-2886 or by using our online estimate form.